The Arizona Cardinals visit the Houston Texans in Week 11 of the 2017 NFL season. PFF previews the top player matchups of the game. RB Adrian Peterson vs. DI D.J. Reader – In the three games since his memorable debut for the Cardinals, Adrian Peterson has struggled to emulate his initial success and has been somewhat held captive behind an offensive line that has struggled to create holes for him. In the last three weeks, the offensive line has given Peterson an average of just 0.8 yards before contact, and Peterson himself has been tallying just 2.48 yards after contact per attempt, good for 29th among running backs over the last three games. As he aims to get back on track, he’ll be looking to get the best of interior lineman D.J. Reader, who has tallied seven run stops from his 50 run defense snaps over the last three weeks. That’s good for a run-stop percentage of 14.0 percent that ranks sixth among defensive tackles in that span. T Jared Veldheer vs. Edge Jadeveon Clowney – With D.J. Humphries out for the year with a knee injury, the Cardinals have had to move the veteran tackle back over to the left side of the line. 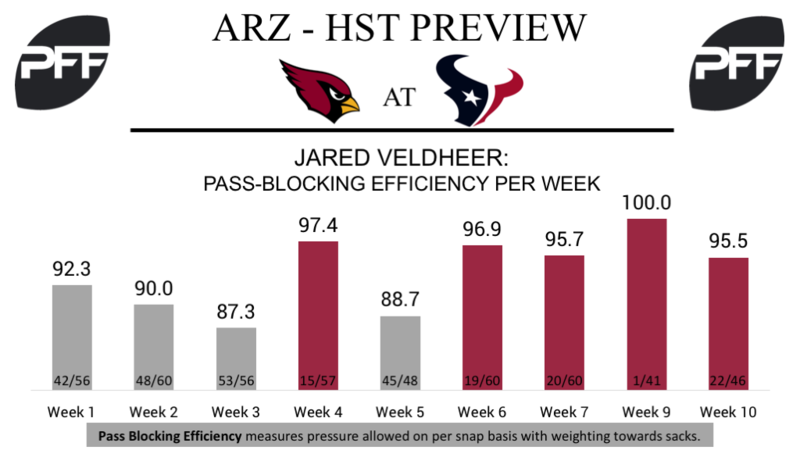 Luckily for the team, Veldheer has finally found his feet in pass protection this season, and over the last four contests, he has played 139 pass blocking snaps and allowed just six pressures, resulting in a pass blocking efficiency of 96.8 that’s good for ninth among tackles in that span. His return to form could not have come at a better time, as Jadeveon Clowney will likely put Veldheer to the test in his first game back at the blind-side. Through 10 weeks, Clowney has produced 34 quarterback pressures from 289 pass-rush snaps, and ranks 17th among edge defenders with a pass-rush grade of 82.5. QB Drew Stanton vs. the deep ball – It’s no secret that Cardinals’ head coach Bruce Arians likes to throw the ball downfield. Since taking over as the team’s starting quarterback in Week 7, Stanton has logged 13 passes of 20 or more yards downfield, but he’s only completed two of them, for a “deep” passer rating of 51.1 that ranks 28th among quarterbacks in that span. However, he could improve upon this against a Texans defense that has already allowed 848 yards to deep passes this year, the most among the league’s teams. *Editor’s Note: This preview was written before Blaine Gabbert was announced as the starting quarterback in Arizona. A full feature on Gabbert’s potential impact can be found here: Blaine Gabbert named starting QB in Arizona. 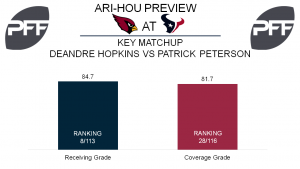 WR DeAndre Hopkins vs. CB Patrick Peterson – Thanks to Peterson often shadowing opponent’s best receivers, this is a matchup we’ll see frequently. In the last two games with Tom Savage at the helm, Hopkins has seen a whopping 29 targets. Despite the volume, Hopkins’ passer rating when targeted of 64.9 in that span ranks 47th among qualifying receivers, while his 2.29 yards per route run in that span ranks 17th. Peterson has been extremely stingy in coverage, leading corners with a reception allowed once every 29.7 coverage snaps, while his 0.5 yards allowed per coverage snap ranks third. One wrinkle to pay attention to is how often Hopkins is used in the slot. Peterson only shadows receivers on the outside, so despite just 61 routes run from the slot to this point, Hopkins could be lining up there often on Sunday to stay clear of Peterson. RB Lamar Miller vs. DI Corey Peters– Miller is now coming off his second consecutive game averaging at least five yards per carry, so even if game flow played a role, the 25 total touches he has seen the past two weeks seems low. In what has the makings of a grind-it-out game, Miller could be more involved this week. With an overall grade of 79.4, Miller ranks 17th among all backs despite forcing just ten missed tackles on the season. To this point, Peters has earned an 80.1 overall grade that would be a personal best. Peters has made an impact against the run with a run stop percentage of 11.8 that ranks ninth among interior defenders. T Chris Clark vs. Edge Chandler Jones– Clark has been the Texans’ left tackle for the majority of 2017 and has struggled to this point, as his 39.6 overall grade ranks 70th among tackles. Having allowed 22 total pressures on 241 pass blocking snaps, Clark’s pass blocking efficiency of 92.7 ranks 60th at the position. Things don’t get any easier this week against Jones whose pass rushing grade of 84.9 ranks 15th among edge rushers. Of Jones’ pass-rushing snaps, 82.2 percent of them come from the right side, so these two will become well acquainted. The 34 total pressures that Jones has accumulated from the right side ranks fourth at the position and with Savage not exactly being fleet of foot in the pocket, a strong performance from Clark in pass protection will be much needed.